Thank you Rod for your nice comments. First, I want to thank all of your for coming to this luncheon. You have honored us by your presence, and I know that some of you have gone to great lengths to be here. I wish to say that it is with a great deal of humility that I stand before you today because I know there are so many other deserving people who could have been selected for this award. 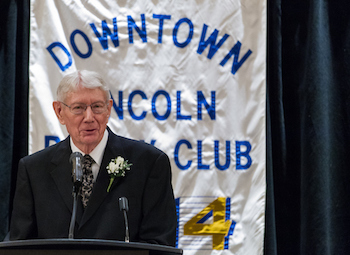 When reviewing the former Nebraskan of the Year honorees, I am in awe to be listed among that group. Those individuals certainly have more than fulfilled the requirements for this prestigious recognition. I only hope that I will be able to uphold the impressive record of contributions of the previous honorees. Since neither Ruth nor I are native Nebraskans, I trust that this honor is yet another indication that we have been accepted as adopted Nebraskans. Thank you very much for accepting my family and me as one of you. On an occasion like this it is sometimes hard to find words to adequately express how you feel about receiving such an award. Never-the-less it is wonderful honor, and I am deeply grateful. The award is highly meaningful to me because the selection was made by a group of colleagues and peers. In my situation, there have been many giants in the form of colleagues, mentors, friends and family who have cared enough to share with me and help me achieve whatever I have been able to accomplish. To all of those individuals I say thank you, thank you very much. Today, I would especially like to thank and recognize my wife Ruth, who has been my partner, helper and wife for more than 57 years. She is a wonderful woman and incredible person. Thank you, Ruth. Although Ruth and I were born and reared in other states, we made a conscious decision to come to Nebraska and to remain here. You wonderful Nebraskans have made a big difference, and for the better I might say, in our lives and those of our children. I regret that our son and daughter and their families could not be here today, but with all the adults working and our four grandchildren in school and one family in California and the other in Florida that just was not possible. The leadership and work opportunities that Nebraska and especially the University of Nebraska have provided us have truly been rewarding and satisfying. We have had the good fortune of becoming acquainted and working with some of the best people in the entire world, and I have had experiences in many countries. Nebraskans and their elected officials have the highest integrity, exhibit great enthusiasm, and have a high degree of creativity. In working with these people we have tried to build on the past and provide for the future. One of the big advantages of staying in the same location for a number of years is that you are able to see the changes that occur and to think you might have had a small part in helping some of them along. There have been many changes in the university, city, and state during the time we have been here. If you go back 25 to 30 years ago you will find that Robert Duncan, Kent Seacrest and I tri-chaired a large committee effort called Star Venture with the idea of looking to the future and bringing about some changes in Lincoln. Not many of our recommendations were implemented at the time since there was not an organized group to follow up and pursue them, but you see some of those ideas popping up from time to time. More recently, there has been a group of individuals called “2015” that coalesced together and they were most effective in getting things completed like the Antelope Valley project and the Pinnacle Bank Arena. Going along concurrently with these activities were numerous changes occurring within the University. Most of you in this room today are younger than I am, and you represent a new generation. You are a generation that has seen more change than any other in the history of humankind. In my opinion, much of this rapid change had been brought about largely because of the explosion of science and technology making possible such things as instantaneous worldwide communications, rapid transportation, improvement and miniaturization of equipment, etc. It is an electronic world that we live and work in today. As we look into the future, let there be no boundaries containing your creativity, no artificial ceilings and no limits or barriers to your ideas. There has been and continues to be a period of great change and social unrest in our society worldwide. During these periods of change, people from all walks of life including business, educational and governmental organizations are being affected. Nowhere is this change more evident than in our higher educational institutions which really represents a microcosm of our society. If we in Nebraska are going to be in the forefront and meet the needs of society both at the present time and in the future, we must provide a high quality educational system at all levels. This may or may not mean more money, but it does mean that all of us - parents, teachers, students, officials and society at large must be committed to and value education. It is especially important that parents be part of this learning process and require that their children take advantage of it. Citizens must also insist on an in depth, transparent and effective accountability for all stages of the educational process. We are no longer just members of a land-locked state or nation, but we are members of a world society that is interconnected through travel, business, education, government and instantaneous transmission of all kinds of information. There is a need for all of us to recommit ourselves to the principles that made our country the greatest nation in the world, because our standard of living and quality of life will depend on that. In closing, I want to thank you again, Rotary #14 and Nebraskans all for the favors and opportunities that you have provided me and my family and for selecting me to receive this high honor and wonderful recognition. Thank you, thank you – one and all.